This page has many Affiliate Links. We donate all proceeds to land conservation non-profits. Read our Code of Ethics. 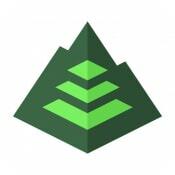 I have been studying iPhone map apps geared to hikers since 2011, and Gaia GPS has emerged as hands-down the best general purpose map app. We use it as the primary mapping tool on all of our trips. In addition to having all the necessary functionality, it has two features that set it apart from the other apps: a very rich selection of map sources and the ability to “download maps for a track”. The app is mature and not buggy, and the customer support and user documentation are top-notch. It works worldwide. 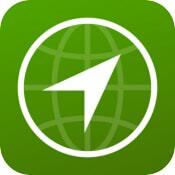 Gaia offers two different and integrated tools: an iPhone app, and a website. The iPhone app is used while on the trail; this is the app we love and recommend. The GaiaGPS.com website is used for pre-trip planning and post-trip sharing, however we use CalTopo.com exclusively for those purposes. Using the Gaia app without the website works just fine; that’s what we do. Users who do not already have pre-trip planning tools that they know and love can explore CalTopo and Gaia’s website and make their own choice about which meets their needs. Nearly every park publishes a pdf map showing park boundaries, trails, roads, campgrounds, and points of interest. These will usually have the most current trail information and are often more detailed than the map views available in elsewhere. 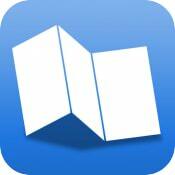 Maplets is a great app for finding and viewing these park maps. Most maps (those drawn to scale) will show your actual location on the map. Download maps when you have an internet connection for subsequent offline use. They have over twelve thousand maps in their inventory, but if the park you want is not already available, submit a request and they will attempt to add it. Maplets does not have a map of the world like Gaia, rather it offers thousands of individual maps. We use it in conjunction with Gaia, as they are different and complementary. In addition to park maps, Maplets has a rich inventory of maps of transit systems, bike routes, airports, museums, university campuses, etc. We love this app and it is easily worth $3. Note this description is nearly identical to the text over at our friend AdventureAlan’s website. Alan and Amy jointly wrote that article. We use this every day when we’re hiking. It is the entire Wikipedia database, except images, offline. The world’s information, in your pocket. Amazing. Sometimes we just need to read about John Cleese’s Dead Parrot Sketch or look at Bob Dylan’s discography. The free version has a few articles so you can see how it works. Then you choose the size you want to purchase. We spent $10 for the whole 5 gigabyte English language Wikipedia database, but if you are price or capacity sensitive you can opt for a subset of the database for as little as $2. But the smaller database versions probably do not include the entry for the Quokka, and it would be sad if one walked into your camp and you couldn’t read about it. We like simple apps that do one thing well, and this is one. It displays times for sunrise and sunset along with astronomical, nautical, and civil dawn and dusk, based on date and location. It’s possible to set an alarm tied to an event, for example we usually wake up 10 minutes before nautical dawn. Well worth $2. Of the seven weather apps we carry this is the one we use 95% of the time. It has no extraneous crap and clearly presents the forecast information we care most about: temps; precipitation likelihood and amount; wind direction and speed. It stores the entire forecast, including the hourly views, so the data remains available for offline use. 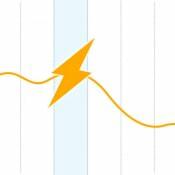 Many of the weather apps we tested did not store the forecast for offline use, which is critical while backpacking. We use the feature-rich weather apps when we are in the midst of a storm and want to see animated satellite imagery, but that’s only possible with a data connection, so is not viable for backpacking. Well worth $2. 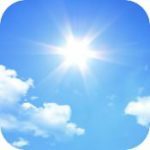 This is an elegant and simple weather app that we use for only one feature, a view which displays average high and low temperatures and average rainfall for each month of the year. We prefer Classic Weather for the ten-day and hourly forecasts. Worth $2 to us just for the monthly averages. If you are using a SPOT Tracker or a DeLorme inReach, this is a useful $5 app for the people at home who are monitoring your location. 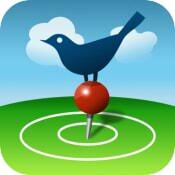 When on an iPhone, it is much easier to use Spot Buddy than the methods provided by Delorme or SPOT. We often use the following power user feature: open the Spot Buddy data in Gaia GPS and view the location information on a USGS map (on the map screen tap the i to the right of the name of the person you are tracking -> Track Log -> Open in… -> Copy to Gaia GPS). 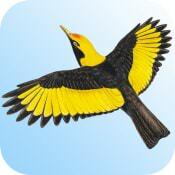 We are avid birdwatchers, and we invest $20-30 for a good bird guide app for each location we visit. 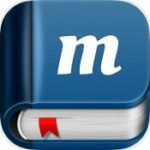 In addition to the images and range maps and textual information, these apps include very useful audio. These may be too expensive for people not very interested in birds, but absolutely worth it for anybody who likes them. Each of the apps listed below is the best available app for the applicable region. Learn more at the App Store. This app has a different user interface than the others so it took some time to get used to it. Now that we are familiar with it we like it very much. 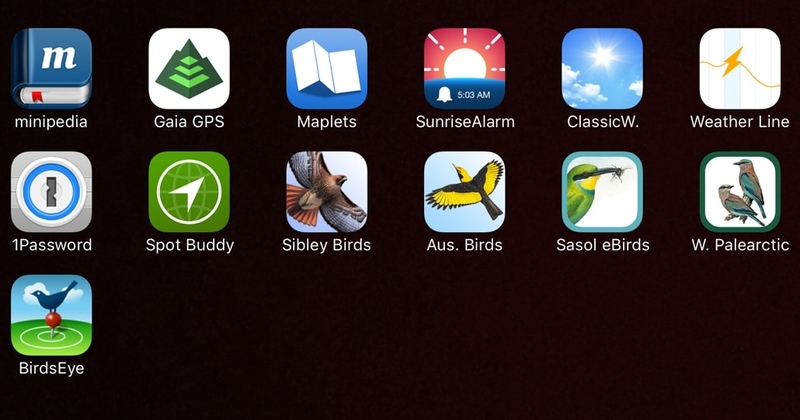 Of the four Europe bird apps we own, this has the best plates and its method of comparing similar species is better than any app for any continent. Learn more at the App Store. 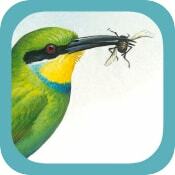 Uses Cornell’s eBird data to provide real-time information about bird sightings world-wide. 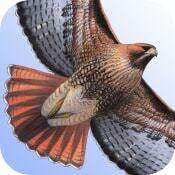 Unlike the other apps described here, this one can only be used with internet access. Useful if you are looking for a particular species, checking to see whether what you think you saw is likely, or seeking a species checklist for a specific area. eBird is arguably the planet’s largest citizen science project and birders worldwide have adopted it. The app and most functionality are free, but you must pay a modest amount for access to all the data and features for a particular region. For example, access to all South America data is $2 per month, so if you are spending two months hiking in South America it would cost $4 to get full access. 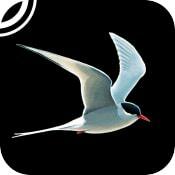 Based on our experience, all serious birders use this app extensively and we can’t overstate this app’s usefulness to birders, from beginners to professional field ornithologists. Learn more at the App Store. I can’t believe you made me copy and paste “Quokka” into a new browser window to find out what it was! Cute. Is Spot Buddy app for iOS still available? I can’t seem to find it in the App store. Apparently Spot Buddy was temporarily removed from the App store but is back now. Mike, I checked it on the 10th when you posted and I also didn’t see it in the App Store, but like you I see it there now. Go figure.